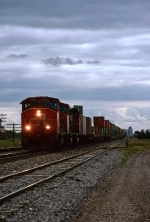 Description: Eastbound double stack passes the Transcona Shops. Description: CN 391 pulls out of the yard with 1500 feet of pick ups, the rest of its train sits on the holly sub, which is another 9000 foot of train. 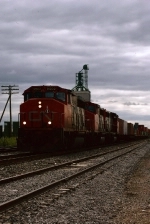 Description: A wide angle shot and view of CN 9574.